Providing a comprehensive introduction to quantum field theory, this textbook covers the development of particle physics from its foundations to the discovery of the Higgs boson. Its combination of clear physical explanations, with direct connections to experimental data, and mathematical rigor make the subject accessible to students with a wide variety of backgrounds and interests. 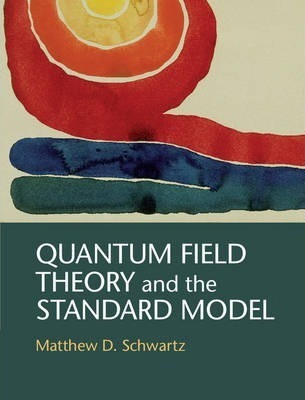 Assuming only an undergraduate-level understanding of quantum mechanics, the book steadily develops the Standard Model and state-of-the-art calculation techniques. It includes multiple derivations of many important results, with modern methods such as effective field theory and the renormalization group playing a prominent role. Numerous worked examples and end-of-chapter problems enable students to reproduce classic results and to master quantum field theory as it is used today. Based on a course taught by the author over many years, this book is ideal for an introductory to advanced quantum field theory sequence or for independent study. Part I. Field Theory: 1. Microscopic theory of radiation; 2. Lorentz invariance and second quantization; 3. Classical Field Theory; 4. Old-fashioned perturbation theory; 5. Cross sections and decay rates; 6. The S-matrix and time-ordered products; 7. Feynman rules; Part II. Quantum Electrodynamics: 8. Spin 1 and gauge invariance; 9. Scalar QED; 10. Spinors; 11. Spinor solutions and CPT; 12. Spin and statistics; 13. Quantum electrodynamics; 14. Path integrals; Part III. Renormalization: 15. The Casimir effect; 16. Vacuum polarization; 17. The anomalous magnetic moment; 18. Mass renormalization; 19. Renormalized perturbation theory; 20. Infrared divergences; 21. Renormalizability; 22. Non-renormalizable theories; 23. The renormalization group; 24. Implications of Unitarity; Part IV. The Standard Model: 25. Yang-Mills theory; 26. Quantum Yang-Mills theory; 27. Gluon scattering and the spinor-helicity formalism; 28. Spontaneous symmetry breaking; 29. Weak interactions; 30. Anomalies; 31. Precision tests of the standard model; 32. QCD and the parton model; Part V. Advanced Topics: 33. Effective actions and Schwinger proper time; 34. Background fields; 35. Heavy-quark physics; 36. Jets and effective field theory; Appendices; References; Index. 'This is an excellent graduate-level relativistic quantum field theory text, covering an impressive amount of material often with a very novel presentation. It would be ideal either for courses on relativistic quantum field theory or for courses on the Standard Model of elementary particle interactions. The book provides interesting insights and covers many modern topics not usually presented in current texts such as spinor-helicity methods and on-shell recursion relations, heavy quark effective theory and soft-collinear effective field theory. It is nice to see the modern point of view on the predictive power of non-renormalizable theories discussed. Once in a generation particle physicists elevate a quantum field theory text to the rank of classic. Two such classics are the texts by Bjorken and Drell and Peskin and Schroeder; it wouldn't surprise me if this new book by Schwartz joins this illustrious group.' Mark Wise, California Institute of Technology 'A wonderful tour of quantum field theory from the modern perspective, filled with insights on both the conceptual underpinnings and the concrete, elegant calculational tools of the subject.' Nima Arkani-Hamed, Institute for Advanced Study, Princeton 'Schwartz has produced a new and valuable introduction to quantum field theory. He has rethought the whole presentation of the subject, from the introductory and foundational concepts to new developments such as effective field theory descriptions of quark dynamics. Students will enjoy viewing quantum field theory from his perspective.' Michael E. Peskin, SLAC National Accelerator Laboratory, Stanford University 'Schwartz's book grew out of a popular year long course in quantum field theory at Harvard. Designed primarily for graduate students, this course also attracts and inspires a number of undergraduates each year. The book is unique in its combination of breadth, depth and readability. Schwartz starts at the beginning of the subject and brings us right up to the present. That the book is neither superficial nor impossibly dense is rather remarkable and makes it easy to understand the course's success.' Howard Georgi, Harvard University 'In this book, Schwartz gives a thoughtful and modern treatment of many classical and contemporary topics. Students and experienced researchers will find much here of value.' Edward Witten, Institute for Advanced Study, Princeton 'Every single one of these pages is packed with information. ... this book grew out of lectures Schwartz has given to graduate students at Harvard, and it becomes very clear that he is well aware of possible pitfalls and problems of understanding that students may have. ... The first part of the book should be accessible for beginning graduate students who have mastered quantum mechanics, special relativity and electrodynamics. The second part of the book will also be useful for advanced students and researchers who want to learn how to perform calculations in the standard model. ... Schwartz has done a great job in presenting his view on this complex matter, and I wish this book had already existed when I learned the subject! I recommend it to anyone dedicated to learning quantum field theory and the physics of the standard model.' Thomas Peters, Contemporary Physics "This is an excellent graduate-level relativistic quantum field theory text, covering an impressive amount of material often with a very novel presentation. It would be ideal either for courses on relativistic quantum field theory or for courses on the Standard Model of elementary particle interactions. The book provides interesting insights and covers many modern topics not usually presented in current texts such as spinor-helicity methods and on-shell recursion relations, heavy quark effective theory and soft-collinear effective field theory. It is nice to see the modern point of view on the predictive power of non-renormalizable theories discussed. Once in a generation particle physicists elevate a quantum field theory text to the rank of classic. Two such classics are the texts by Bjorken and Drell and Peskin and Schroeder; it wouldn't surprise me if this new book by Schwartz joins this illustrious group." Mark Wise, California Institute of Technology "A wonderful tour of quantum field theory from the modern perspective, filled with insights on both the conceptual underpinnings and the concrete, elegant calculational tools of the subject." Nima Arkani-Hamed, Institute for Advanced Study, Princeton "Schwartz has produced a new and valuable introduction to quantum field theory. He has rethought the whole presentation of the subject, from the introductory and foundational concepts to new developments such as effective field theory descriptions of quark dynamics. Students will enjoy viewing quantum field theory from his perspective." Michael E. Peskin, SLAC National Accelerator Laboratory, Stanford University "Schwartz's book grew out of a popular year long course in quantum field theory at Harvard. Designed primarily for graduate students, this course also attracts and inspires a number of undergraduates each year. The book is unique in its combination of breadth, depth and readability. Schwartz starts at the beginning of the subject and brings us right up to the present. That the book is neither superficial nor impossibly dense is rather remarkable and makes it easy to understand the course's success." Howard Georgi, Harvard University "In this book, Schwartz gives a thoughtful and modern treatment of many classical and contemporary topics. Students and experienced researchers will find much here of value." Edward Witten, Institute for Advanced Study, Princeton "Every single one of these pages is packed with information. ... this book grew out of lectures Schwartz has given to graduate students at Harvard, and it becomes very clear that he is well aware of possible pitfalls and problems of understanding that students may have. ... The first part of the book should be accessible for beginning graduate students who have mastered quantum mechanics, special relativity and electrodynamics. The second part of the book will also be useful for advanced students and researchers who want to learn how to perform calculations in the standard model. ... Schwartz has done a great job in presenting his view on this complex matter, and I wish this book had already existed when I learned the subject! I recommend it to anyone dedicated to learning quantum field theory and the physics of the standard model."